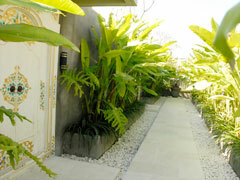 Bali Spa Once you step in, you will be surrounded by a tropical green with sunshine. 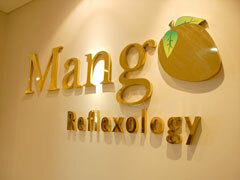 Mango spa is on the third floor of a large shopping mall 'BRASCO' which is the latest entertainment spot in Bali. Their recommended menu is the one with mango products which leads you to a tropical resort atmosphere with the great fragrance. A large outlet mall which opened on November, 2011 and has Mango Spa and a cafe inside. 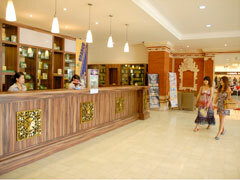 You can enjoy reasonable shopping and have a meal or drinks before/after spa treatment. 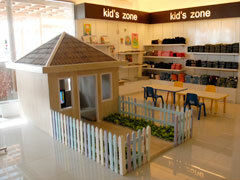 Kids over age 3 can stay at the kids's zone in the shopping mall while parents are shopping or taking a spa treatment. A shop staff are available to watch kids by buying a coloring (Rp.27,000-58,000). Kids can watch videos for free without shop staffs in a case not purchasing a coloring. The natural art of healing techniques focus on foot zones using finger point pressure, aims tonormalize the body functions and to restore the natural flow of body energy. The treatment specially designed for your hand & foot zones to ensure the optimal state of your health and reflect all part of the body complimented with head, neck, shoulder and back massage. 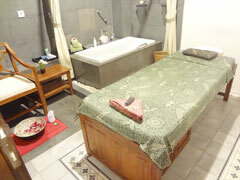 Spa course including foot bath, scrub and choose oil body massage and aromatheraphy buble bath. This course including traditional body scrubs & mask followed by aromatherapy bubble bath plus.Hair Creambath is the final touch. 2 hourse body treatment using red wine and wine body scrub, grape body mask for warmed up your body and take off toxin inside your body. 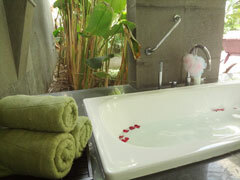 At the end, please enjoy red wine bath for relax. ■Free return transport from/to Kuta, Legian, Seminyak and Kerobokan areas with over 2 people booked with over 2 hours courses. Tanah Lot areas need additional Rp.200,000/one way. 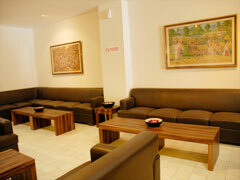 Children can wait in the lobby or the treatment rooms. Also, a kids space in the shopping mall is available. Children over age 8 can take the treatment courses. 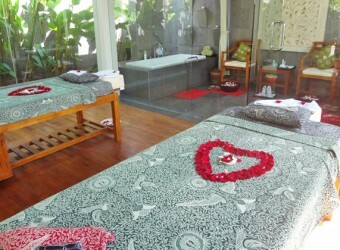 Bali has rich on fruit including mango, however I think it's difficult to find spa products with aroma of mango in Bali. 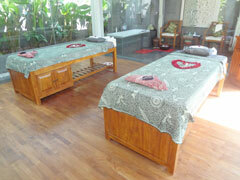 This spa offers spa treatments using cream with the aroma of mango that smells very good. Glass-in VIP room really wonderful. It was good to have spa treatments here!